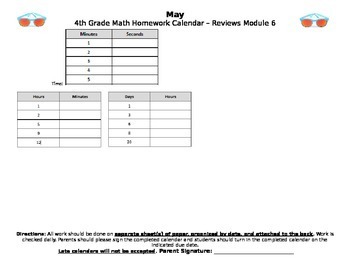 This May 2018 Calendar reviews content from Module 7 Eureka Math/Engage NY. All answers are included and it is in Word Format so you can edit as needed. A bundle of all 2017/2018 homework calendars and extras is now available in my store. ***This would also be a great extension for gifted 3rd grade students or to cover gap areas for struggling 5th grade students. 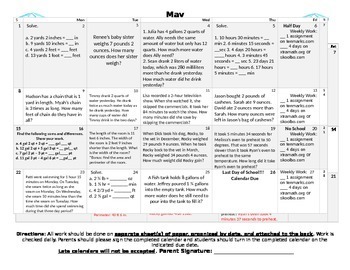 ***I created the homework calendars to use instead or as supplement to the Engage NY Math Modules. The problems come straight from the Engage Curriculum so students are still getting the necessary practice using the rigor and steps required by the CCSS and Engage. ***I love Engage NY but I struggle with giving students the homework for a topic just learned. I also have problems with students losing homework pages and packets. To fix all of these issues I created a calendar that reviews content learned in an easy to use and manageable way. I feel homework is a necessary piece towards student confidence however I do not want it to be a family burden. ***If you are not sure this is what you want, you can download a FREE October calendar as a PDF from my store.